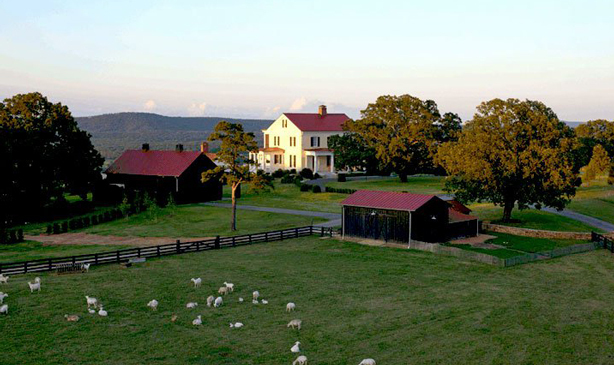 P Allen Smith’s Moss Mountain Farm, venue for upcoming Garden2Blog event. There is a long tradition of sharing among gardeners. They share information, ideas, seeds, cuttings, and some–even non-gardeners–share their land, offering it to those wanting to garden but without a plot of their own to cultivate. In this spirit of sharing, I am honored to to be included among a group of twenty-three bloggers invited to Garden2Blog, a two-day event April 26-27 hosted by award-winning garden and lifestyle designer, P Allen Smith. During Garden2Blog, we’ll join Smith and partners to share ideas and trends, learning from each other, growing and nurturing through synergy in the same way Smith cultivates his own spectacular gardens, writes his Garden Home series of books, and hosts his public television program, P. Allen Smith’s Garden Home and syndicated show, P. Allen Smith Gardens. He doesn’t need much of an introduction since he is, as his Facebook page indicates, a “public figure.” Television host, best-selling author, regular guest contributor on NBC’s The Today Show, featured in numerous national publications, founder of Heritage Poultry Conservancy, publisher of the P Allen Smith website which is chock full of home and garden information, recipes, design ideas…I could go on, but I want to save something for later. And to top it off, from my recent correspondence with him, he is also a genuinely nice guy. Really looking forward to meeting the celebrated Allen (P Allen? Or shall I just call him Smith? ), seeing his amazing spread, and reporting back to you with photos and stories from what will certainly be a unique creative experience. 225,000 Daffodils have bloomed at Moss Mountain Farm! 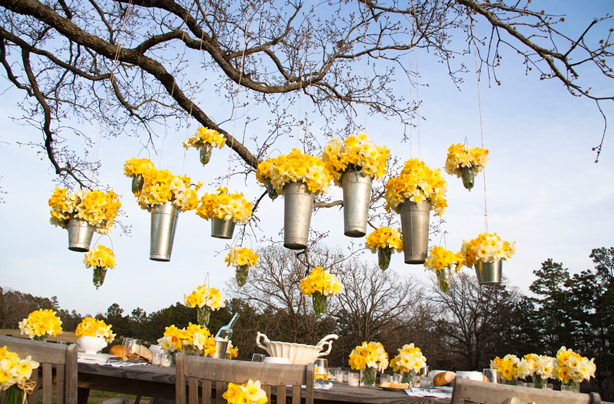 P Allen Smith has created a clever DIY Hanging Daffodils arrangement using French watering cans, small silver buckets with handles, and glass votives with wire hangers. Visit Tobi Fairley’s wonderful design blog for step-by-step directions. And if you are in the area or want to make a special trip to Little Rock, it’s Spring Open House days at The Garden Home Retreat at Moss Mountain Farm. You can celebrate Earth Day at the farm with a tour of Allen’s eco-friendly Garden Home Retreat and surrounding gardens. After the tour, visit the gift shop and enjoy a buffet lunch. Tours scheduled for April 22, May 20, and June 17. Reserve your spot! Droper sheep in the fields: how pasturally perfect is this? 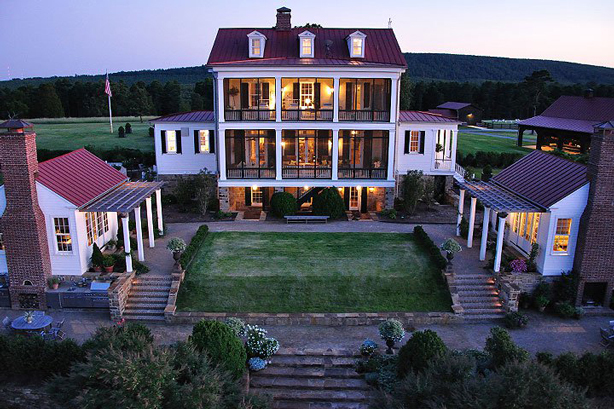 West Terrace at P Allen Smith’s Moss Mountain Farm. Tours and Trends and Talks, Oh My! 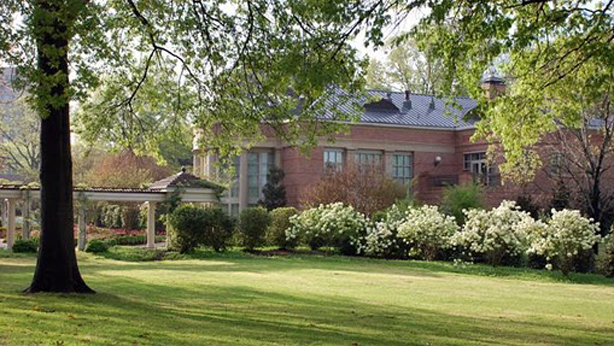 The event will bring us to Smith’s garden estate, located in Little Rock, Arkansas’s historic Quapaw Quarter. We’ll be treated to a personal tour of the Garden Home, a 1904 Colonial Revival cottage surrounded by a series of garden rooms designed by Smith. 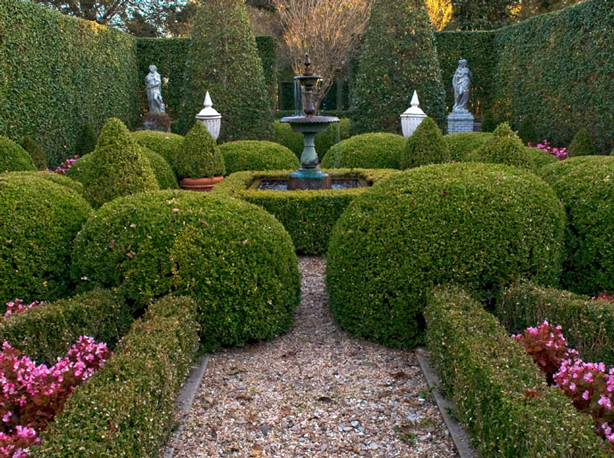 He created the garden to illustrate his 12 principles of design, the basis of his book, P. Allen Smith Garden Home, the first in his Garden Home series. 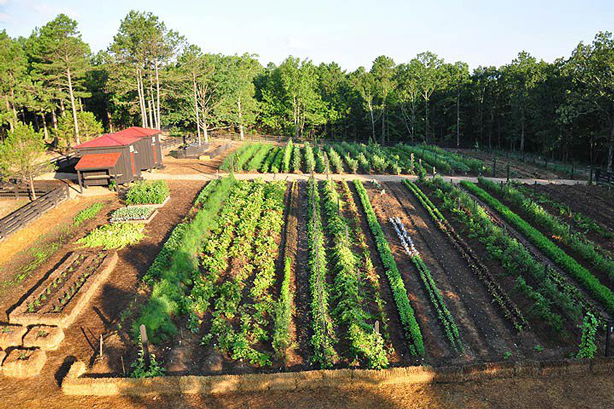 The one-acre vegetable garden at Moss Mountain Farm. No wonder he is such a great cook! Overlooking the Arkansas River Valley, the Garden Home Retreat encompasses more than 500 acres of a farm dating back to 1840. 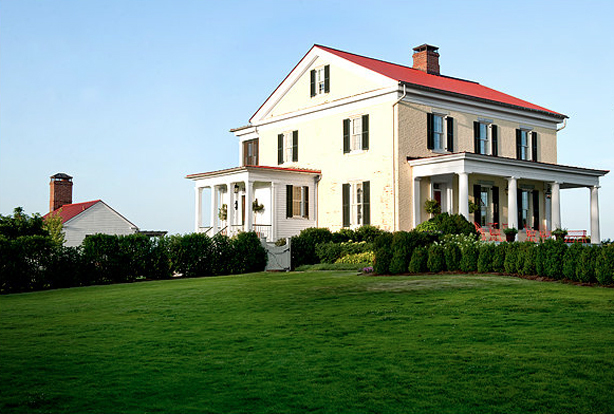 The centerpiece is the cottage, built in the Greek Revival style and constructed in an earth-friendly manner. Directly behind the cottage is the croquet lawn, framed by a summer kitchen and art studio. The surrounding garden includes a fountain garden separating two wings of garden rooms filled with a mix of annuals, herbs, perennials, roses, shrubs and ornamental grasses. Beyond the flower gardens are orchards of heritage apple trees, stone fruit and blueberries, acre vegetable gardens, a bluebird trail, wildflower fields, and daffodil hill, which overflows with more than 225,000 daffodils each spring. Various outbuildings, from barns to mobile chicken homes, are found throughout the grounds and surrounding pastures. Arkansas governor Mike Beebe and First Lady Ginger Beebe (and I hope, Viper, the First Dog of Arkansas) will host us in downtown Little Rock for a tour the Arkansas Governor’s Mansion. Sounds like it will be an urban garden to be remembered. According to the Mansion’s website, the Georgian Colonial is flanked by two colonnaded walkways linking the Mansion to two cottages. Gardens frame the home, viewable through the colonnades. 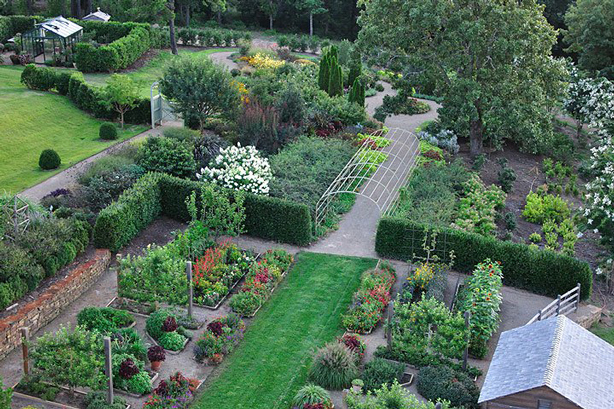 The estate’s eight-and-one-half acres feature one of the largest herb gardens maintained by the National Herb Society, as well as a vegetable garden, which is an ongoing project of the Arkansas Master Gardeners. In other words, a tour of a very large Little Rock urban garden. Side view of the Governor’s mansion. We’ll travel fourteen miles southeast of Little Rock to the Arkansas Delta, to visit Marlsgate Plantation, a columned Greek Revival Mansion overlooking Bearskin Lake. Marlsgate, which sits amid acres of rice, cotton and soybeans, is listed in the National Register of Historic Places and is home to Mr. and Mrs. David Garner, Sr. and David Paul Garner, Jr. Renowned for his professional expertise as an artist, floral designer, and “social caterer,” David Garner will lead us on a tour of the mansion and gardens. “Our Garden Home partners have got some great workshops and activities cooked up for everyone, and I think we’re going to have a lot of fun.” said Smith. “I don’t want to give away too much, but let’s just say there’s nothing wrong with a little competition among friends!” (There’ve been whisperings of a container competition!) Participating partners who’ll be hosting activity-driven workshops and industry trend discussions include Bonnie Plants, Corona Tools, Garden Safe, Jobes, Laguna Ponds, Proven Winners, STIHL, and The Berry Family of Nurseries. Wanna know who will be there? Visit Part II: Sowing Stories at P Allen Smith’s Garden2Blog. Tags: bloggers, creativity, garden events.